Many times we become victims of phishing attacks. We have to know how does phishing work and how to stay safe from phishing attacks for the safety of our privacy. Experts from Anti-Phishing Working Group (APWG) recently released a report revealing a massive rise in a number of phishing attacks around the world. It is observed to be the most commonissue for growing organisation and individuals. Every individual who uses internet needs to be aware of these attacks and it is important to make efforts to stay safe from them. Well, before we get deeper into methods to avoid phishing attacks, it is important to understand what they are. In simple terms, phishing attacks are described as a kind of identity theft scenarios where cybercriminals try to access sensitive and personal information through unauthorised activities. 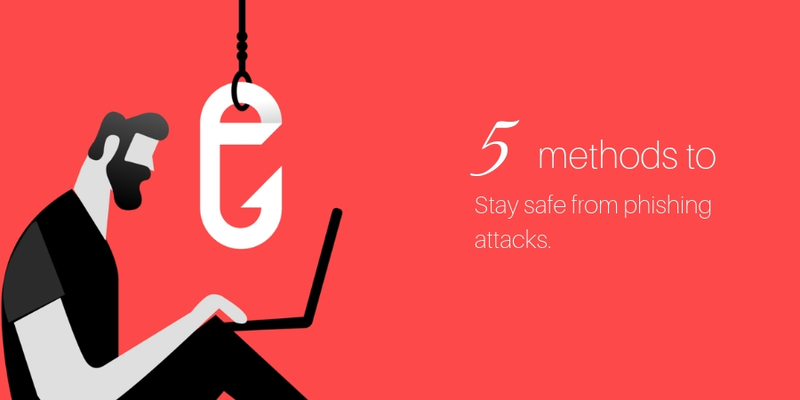 It is possible to eliminate the chances of phishing attacks if you act smart and sensible while browsing online. As most of the phishing attacks are carried outin the form of email attachments, it is advised to be cautious before clicking on unknown links in your inbox. An email must be opened only when the user is pretty sure about its source and after finding it authentic. Try to be more careful about the emails that ask for some confidential information such as banking details or personal information. Note that, legitimate organisations never ask you topersonaldetails via email, hence it is important to avoid such emails as they can be phishing attacks. In order to stay safe from phishing attacks, it is important to pay attention to the shortened links on social media channels. Experienced cybercriminals use these specially designed links to direct users to fake websites. The authenticity of these links can be verifiedby hovering the cursor over the link in your email. You then need to check if the link that appears while moving the mouse cursor over the link and the one that appears in the email text are the same or not. Criminals in the cyber world use some fake links to steal personal information from your device and you can easily become a victim of malware attacks. Most of the phishing emails seem fairly obvious; they are usually loaded with wrong punctuations, capital words, typing errors and unwanted exclamation marks. You may also observe some impersonal greetings in these emails; it can be the Dear Madam/Sir or Dear Customer. Cybercriminals often end up making lots of mistakes in the general content of these emails; sometimes, these actions are taken intentionally to pass the spam filters. Experts at Totality services, who are an award winning IT support in London, advise recipients to be more careful about opening such suspicious emails. In general, there are very rare cases when some bigandlegitimate company ask its customers to take some actions with fixed deadlines. In most of the cases, such terminologies are used by hackers and is a common sign of phishing. In order to stay safe from such cyber-attacks, it is important to completelyignore such emails. If you find something that requires urgent action, it is better to contact the relevant company before taking any further action. In most of these cases, it is likely that hackers are trying to portray themselves as legitimate service providers to steal data from your system. When you are browsing the web, it is always good to pay attention to the security of your connection. In general, secure websites on the internet are identifiable by the https:// code at the beginning of the website addressandthe security lock icon which is visible next to the address bar on most of web browsers. It is important to check such security parameters while submitting some sensitive information related to bank accounts, credit or debit cards online. In addition, avoid connectingto public internet or unsecured Wi-Fi as they are not secure and increases the risk of cyber-attacks. Something strange happened to me this morning when I went to a site and commented on it. That site closed out and some virus warnings came up with messages that my ip address was being used without my permission. It was even talking. I'm not really sure if that is what phisiong is but it scared me to death. I'm going to use your tips to try to stay safe because I'm online a lot and I get a ridicuous amount of emails. YES!!! I feel like everyone needs to read this -it's SOOO common these days!! these are all great tips. i feel like it's easy for consumers to be duped by these attacks! What an awesome tips, to keep your company or your self my phishing attacks. These are amazing tips. Phishing attacks are becoming increasingly smart and a lot more frequent. It is really rampant this that I almost fell for it but thank God I did not. Thanks for sharing this tips. I was almost a victim of a scammer some weeks ago. The hacked into my fiend's account and was chatting with me. I thought it was my friend chatting so i kept the conversation until he said he will send me a link and i should quickly click it since it was urgent. I quickly called my friend's line who told me his account has been hacked. Deadlines are truly a subtle cue to identify scammers. it is such an important post! I think everyone, literally everyone should know about it and be aware! thank you so much for taking time and composing this post! The internet can be such a scary world. Thanks for sharing such an important post. Great points! Being wary of the emails that you receive and the links you come across is crucial! This is a very important topic. Thank you fro sharing this. It is important that we are aware with this kinds of circumstance. OH yes! We really need to know all about these and I am really glad that you create this. Thanks for the information. I really needed it now. And it really is going to help me I guess. Ugh, my biggest fear to get hacked. Thanks for the tips, I'm always on the lookout!